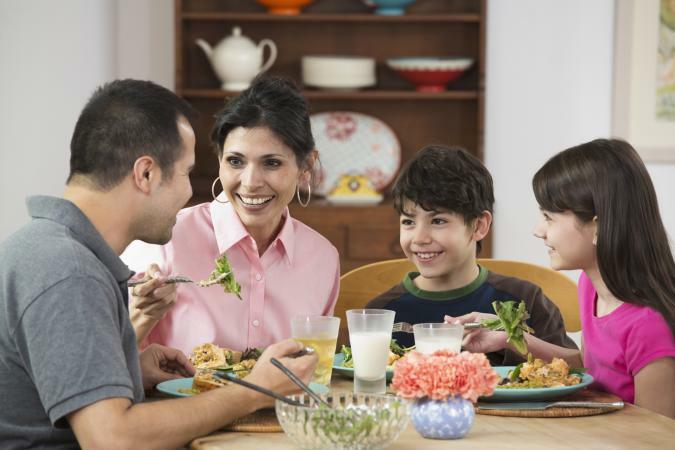 Preparing dinner in 30 minutes can help make busy family weeknights easier while offering a nutritious meal you can sit down together to enjoy. With a plan in place, you can easily have a full meal on the table in 30 minutes or less. Burgers are a popular family meal because they are quick and easy to prepare. Whether you're enjoying turkey burgers or hamburgers, it may start to feel like more of the same if you don't have a few creative recipes up your sleeve. 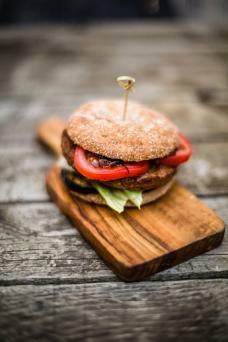 So try these Italian burgers with a simple fruit salad on the side for a tasty family dinner. The Italian Burger recipe yields four burgers and the salad serves four as well. In a bowl, combine the ground beef, Italian sausage, garlic, oregano, eggs, and breadcrumbs. Mix with your hands to combine and form into four balls. Flatten into patties. Heat a skillet on medium-high. Add the oil and heat until it shimmers. Add the patties and cook until browned on both sides, about five minutes per side. Top with the cheese. Reduce the heat to low, cover the pan, and allow the cheese to melt, about two minutes more. While the burgers cook, toast the buns in the oven or in a toaster oven. In a small bowl, whisk together the mayonnaise and pesto. Spread on the prepared buns. Add the cooked burgers and top with lettuce and tomato. In a medium bowl, combine the grapes, strawberries, blueberries, bananas, and apples. In a small bowl, whisk together the honey, orange juice, yogurt, and cinnamon. Toss with the fruit. Taco night doesn't always have to be Tex-Mex or Mexican food. Try these simple, flavorful Asian tacos with a side of pre-cooked rice. You can buy pre-cooked rice in the freezer or rice section of your local grocery store, from brands like Annie Chun's and Uncle Ben's, and heat it up in the microwave. The taco recipe serves four. Heat your oven to 350 degrees Fahrenheit. Wrap the tortillas in foil and heat them in the oven for 10 minutes. Meanwhile, in a small bowl, whisk together the lime juice, 1 tablespoon of the gingerroot, 2 of the garlic cloves, 1 tablespoon of the sriracha, and 1/4 cup of the olive oil. Put the fish in a shallow pan and pour the lime juice mixture over the top. Let rest for five minutes. Heat a large skillet on medium-high heat. Heat the oil on medium-high until it shimmers. Remove the fish from the marinade and cut it into one-inch cubes. Cook in the hot oil until it is opaque, about five minutes. While the fish cooks, in a small bowl whisk together the apple cider vinegar, the sugar, the hot mustard, the remaining 1 tablespoon of gingeroot, the remaining 2 garlic cloves, the remaining 1 tablespoon of sriracha, and the remaining 1/4 cup of oil. In a small bowl, combine the coleslaw mix and the scallions. Toss with the vinaigrette. 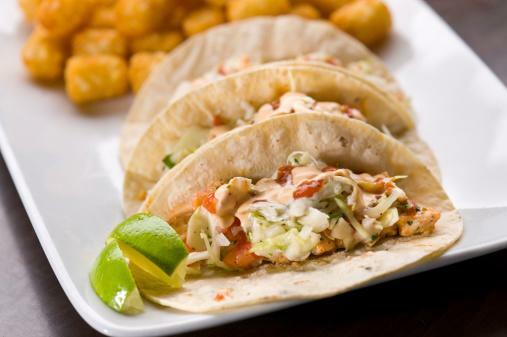 To assemble the tacos, top each tortilla with 1/4 of the fish and 1/4 of the slaw. Then, sprinkle with the chopped fresh cilantro. Serve with the rice on the side, drizzled with the soy sauce, if desired. Flank steak cooked medium-rare cooks quickly. You can grill it outdoors for about five minutes per side, or you can use an indoor grill (like a Foreman grill), which allows it to cook even more quickly. 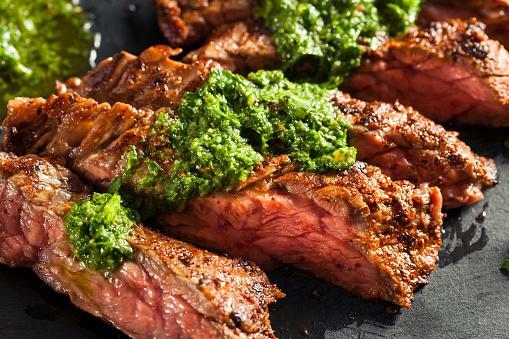 The true flavor of this recipe is in the vibrant chimichurri sauce you spoon over the top. Broiling tomato halves adds flavor to the tomatoes and adding a little cheese over the top makes them a delicious side dish. Plus, the recipe only takes a few minutes to put together. Preheat your grill on medium-high. Season the steak on both sides with the salt and pepper. Oil the grill and cook the steak until it is medium-rare, about five minutes per side. Allow it to rest for 10 minutes. Meanwhile, prepare the chimichurri sauce. In a blender or food processor, combine the vinegar, garlic, oregano, salt, pepper, red pepper flakes, and oil. Pulse for 20 one-second pulses, until the herbs and garlic are finely chopped. Slice the steak against the grain and spoon the sauce over the top to serve. Arrange the tomatoes on a rimmed baking sheet, cut-side up. In a small bowl, whisk the garlic with the olive oil. Brush on the tomatoes. Broil for five minutes, or until the cheese browns and bubbles. Salad is always a nutritious option for a side dish, and when you drizzle hot bacon dressing over a bed of baby spinach, you've got a mighty special salad as a side for this toasty, tasty sandwich. Make the salad while the sandwiches cook. Preheat your oven's broiler on high. In a medium bowl, combine the crab meat and scallions. In a small bowl, mix together the Boursin cheese and the cream cheese. Fold into the crab mixture. 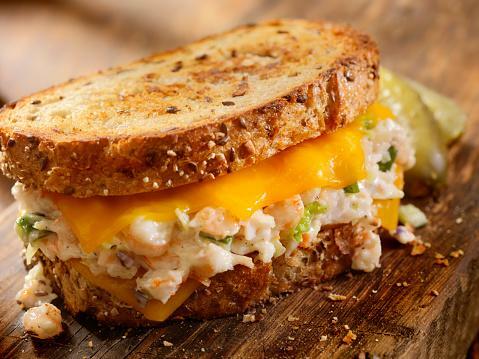 On a rimmed baking sheet, spoon the crab and cheese mixture on four slices of the toast. Top with the cheddar cheese. Broil until the cheese is melted and the crab is warm, about five minutes. Top with the second slice of toast. In a large bowl, combine the spinach and bacon dressing. Toss in the Parmesan and pepper. When you're busy, it doesn't take a lot of time to cook flavorful, nutritious meals for your family. With a handful of quick recipes, every day can yield a dinner your entire family will love.